We did a few crafts this rainy Saturday afternoon. 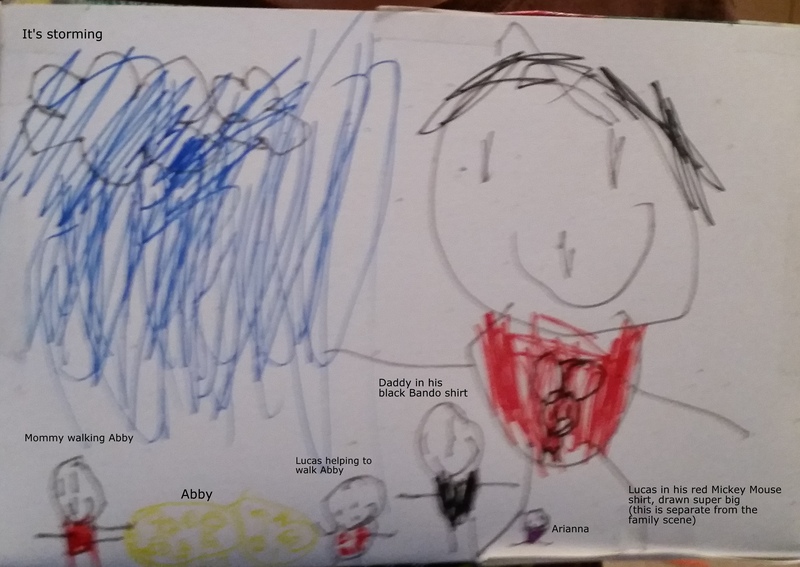 I really love doing crafts with the kids…just usually they don’t listen and don’t wait and then get upset when their stuff is messed up. The kids were really well behaved today and I didn’t lose patience with them (barely at all). If crafts keep going this well, I might start doing them more often. This was Lucas and Arianna’s idea. Arianna wanted to paint handprints, Lucas suggested making cards for Daddy, and then I found the saying on Pinterest. Lucas got out the cardstock (I folded) and then he and Arianna painted each other’s hands and made the cards. It was almost an entirely self-done project. Big kids rock! This stuff was awesome. Easy to make and so squishy. I had the supplies on hand from back whenever I first pinned these projects. I’ve been on a productivity kick this week. Cleaning (and keeping clean), organizing, and following through on Pinterest pins. 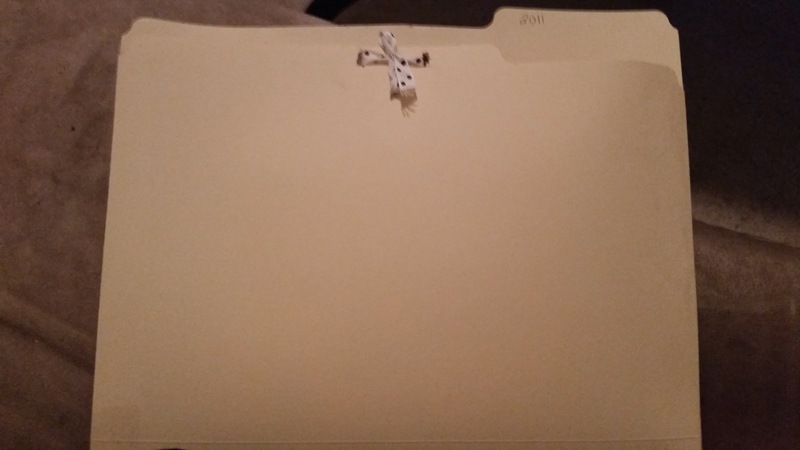 I made a This Week folder and moved ten pins that I wanted to accomplish this week. 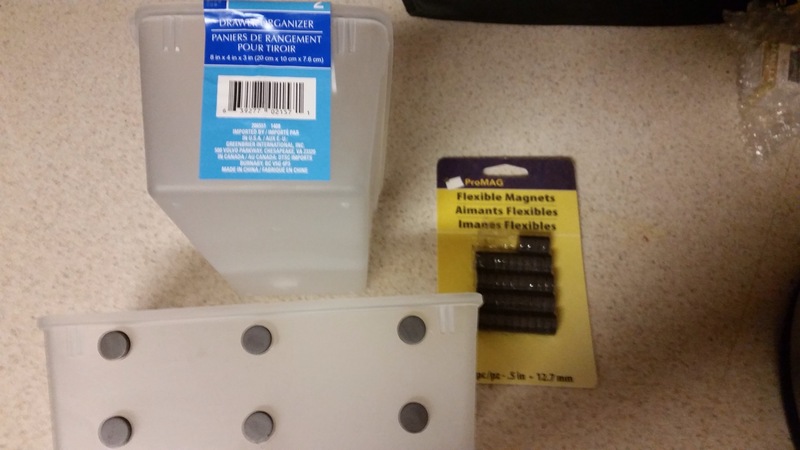 I tried making a magnet holder for my fridge using some magnets I had in my craft supplies and a drawer organizer I bought for .50 at the dollar store. The magnets weren’t strong enough to hold it (is there a way to measure a magnet’s strength?) so that was a bust. I organized 2.5 drawers from the scrapbook room that were full of old cards (ok so really I should throw them away but I’m not there yet) and misc stuff. I made folder pockets and sorted them by year. I also got binders and sorted through all the kids’ papers I’ve kept to make binder scrapbooks. 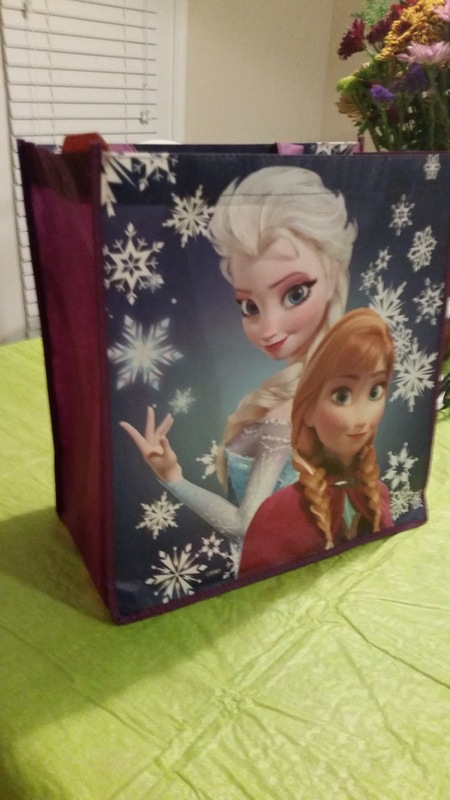 On a shopping trip to Target I impulse purchased two Frozen tote bags from the $1 spot. 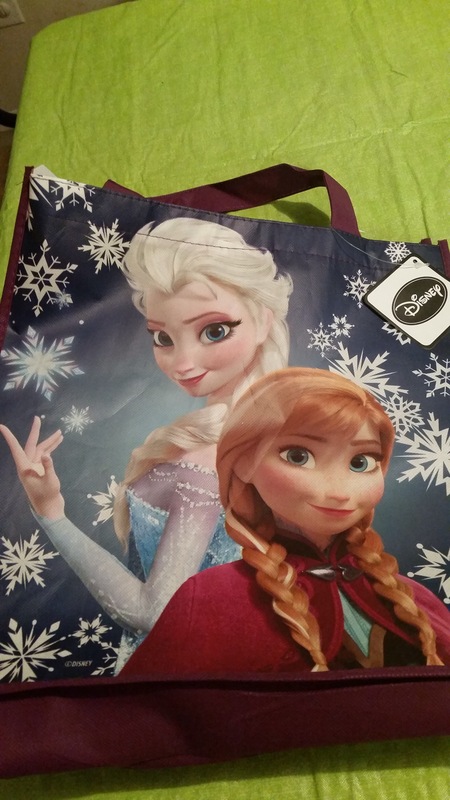 I have zero need for these tote bags as I already have tons, but they were Frozen and Only $1. So I had an idea to turn them into storage tote bins instead. I cut a cardboard sheet from a shipping box to fit into the bottom. Then I cut little strips and stapled them to the top rim to hold the, open. I might come up with a better solution than the staples for long-term, (I have some cute brads perhaps) but the staples worked for a quick and easy. Did you know you are supposed to wash your washing machine? Never occurred to me until I came across a How To pin on Pinterest. Our machine is around 30 years old and probably was never washed in all that time. It had nasty soap scum gunked up everywhere, but it was one of those things you don’t really notice or think about. I was really impressed with how much nicer it looked and how easy it was to scrub off the gunk with a toothbrush once I’d gotten the hot bleach soaking. I know, I’m 33 and I actually have never tie dyed. It’s like one of those super common kid activities that I somehow never got to do. Not that I really cared. So at school they are doing color days and each week the whole school wears a certain color. This was fine the first week when we did red, blue, green. But this second week we have days for pink and purple. Unsurprisingly, Lucas (and Landon) do not own anything pink or purple. At first I was going to check the consignment sales for cheap pink and purple shirts. 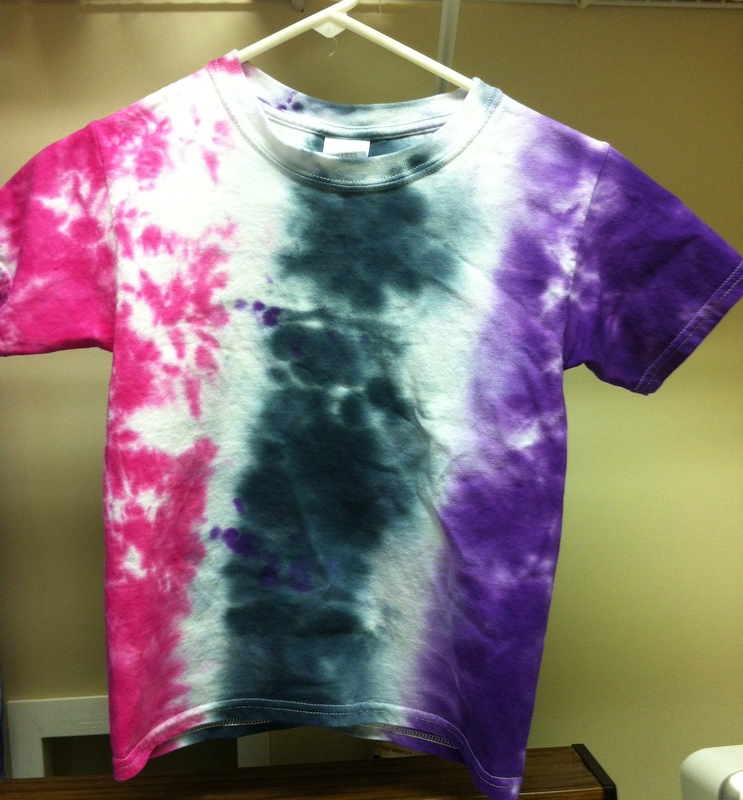 But then I had the idea to make a tie dyed pink and purple shirt and he could wear it for both days. I saw some cool examples that included a lot of black, which helps make having a pink and purple shirt look more boyish, and today we made some shirts. The first one Lucas made was a black to purple to pink ombre. This isn’t really tie dye, just dying. You lay the shirt flat and brush the colors downward. I’m pretty pleased with the result, especially with it being my first go. Only issue was that when it was hung upright, the purple started bleeding down into the pink, so the pink section ended up being pretty small. I should have left it flat. Pink day isn’t until Friday, so after he wears it doe purple Monday, I’ll dump some more pink dye at the bottom to try to brighten the pink section. After I let it set for about 6 hours, I noticed that the colors bled out more for a nice smooth, even look – you can’t see the brush strokes anymore. The black bled to a greenish color, so now it is black-green-purple-pink. After i washed and dried it, I noticed a lot of color leached from this one. I think this is a combination of the smoother fabric of this shirt as well as that the colors were watercolored on rather than soaked in the dye. The second one was done in like two minutes time because a storm was quickly approaching and I was just trying to get it done. It involved rolling the shirt top to bottom around a tube, scrunching it inward a little, and then dousing it with dye in different sections. I kept this one in a ziploc bag, and a few drops of purple got elsewhere on the shirt, but it came out okay for the most part. It seems the coarser cotton fabric of this one held the dye better than the soft blend of the first shirt. Just wish I’d had more time with this one. All in all I’m pleased with my first attempt. When I have more time I’d like to actually try to make designs instead of just three solid sections of color.